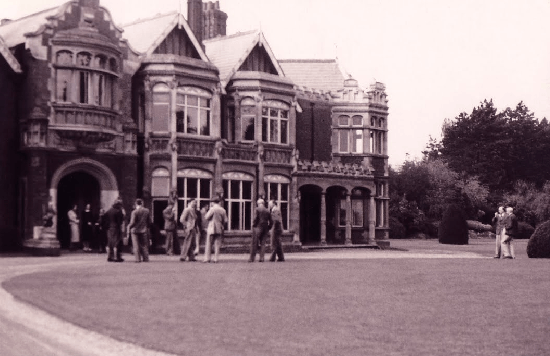 In August 1938, a group of men showed up to a Victorian Gothic mansion in the town of Bletchley Park in Buckinghamshire. It was a couple of weeks after the Glorious Twelfth, the start of hunting season in England. Ten bucks says they were all wearing tweed knickers and jolly caps, but that’s beside the point. 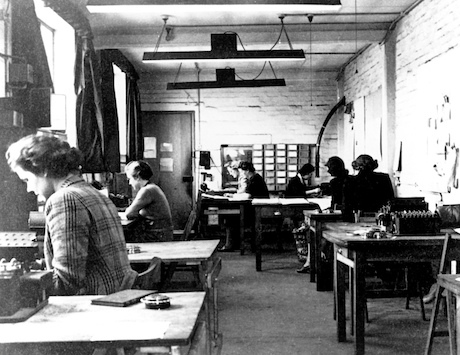 Women working at Bletchley Park during World War II. And, colossal haves been the changes brought about by the ensuing Digital Age. Every day, existing power structures fade a little more and at times, the world seems more uncertain than ever. And, yet within these changing fortune of time, it has never been easier to know and understand yourself. We can capture enormous amounts of data by using technology to track the things we do, with whom we do them; how often, where and when. 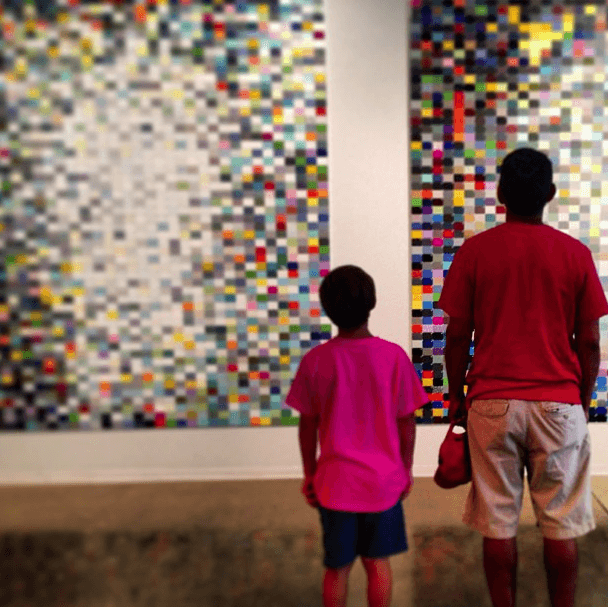 We can become our own personal pattern recognition experts by quantifying our lives. The artist Laurie Frick who has a background in engineering, knows a lot about this. She has an exhibit on display Contemporary Oklahoma on the state fairgrounds that should pique your curiosity about your own daily routine. Laurie tracks everything about herself — steps walked, calories expended, her weight, sleep patterns, time spent online, GPS location, daily mood and food intake. She uses gadgets, websites and smartphone apps in this self-imposed surveillance, and then she transfers the data to wall size patterns that are fun and colorful to see. They include technical, laser cut drawings on thick watercolor paper. The cuts are suspended like mobiles under soft pink, green and yellow lights. The walls that reflect her moods are my favorite. She uses laminate countertop samples and assigns different colors to different emotions. The pattern that emerges is dark or vibrant around the edges and light or muted in the middle. It all represents a way of seeing ourselves — knowing ourselves better. 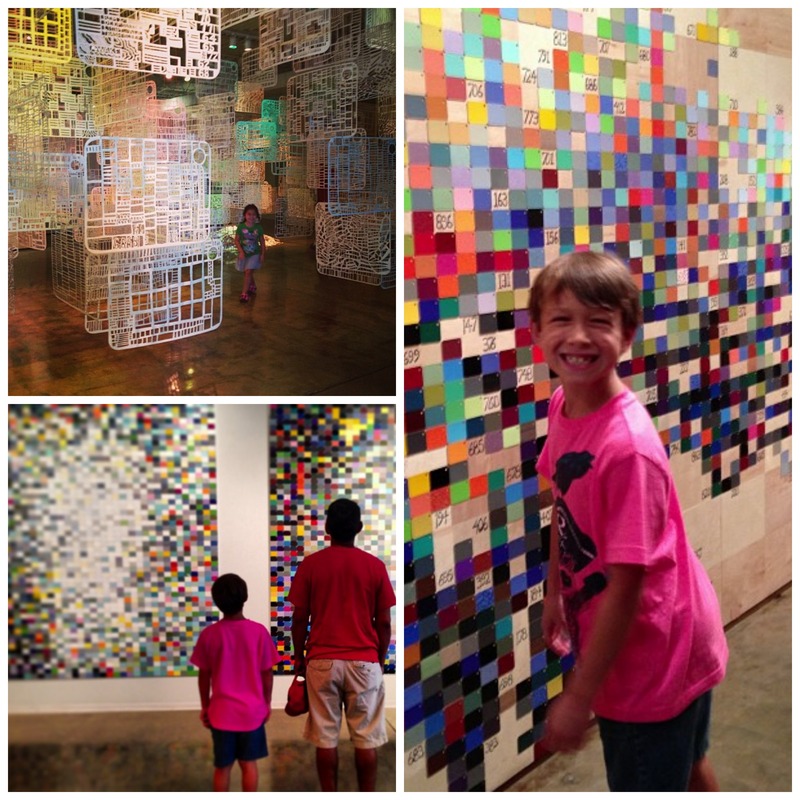 Sully and Robert view the Laurie Frick exhibit at Contemporary Oklahoma. So, once we document and examine our history, recent or otherwise, we can stop letting the past construct the present. We can stop living in fear and stop repeating the same mistakes. We can gather and analyze our data and decipher our own lives. In time you can crack the code of your life. You can stop fighting that ridiculous war – whatever it might be. Subscribe to JenX on KOSU podcast via iTunesU. I became really interested in pattern recognition after watching the PBS drama Bletchley Circle. The mystery series is set in 1952 and features four women who worked as pattern recognition experts and codebreakers at Bletchley Park during the war. They pool their codebreaking skills to find a serial killer in London. It’s a great show and is now available on DVD. Here are some links to information about self-tracking websites and apps. Enjoy! Check out the Quantified Self, an international community of collaborators, users and makers of self-tracking devices. Track where you go with Foursquare. Track weight, weight-loss, calories, etc. with Fitbit. Stay on task with StayFocused. Monitor your moods with Moodjam. Finally, I’ve been searching for a self-tracking tools for prayer, meditation and the spiritual journey. If you know of one, leave me a comment. And if you make progress on cracking the code of your life, I’d love to hear about it. You can leave a comment or email me, jenx1967[at]gmail[dot]com. How do you crack the code on your life? This is really fascinating – this type of thing can help us to get a much clearer view of the mosiac of how we are really living our lives and spending the most valuable (and limited)resource we have, which is time. Hi Chloe! I think so, too. I’ve been really inspired by Frick and have been obsessively tracking myself on FourSquare and just started MoodJam a couple days ago! Should be interesting to see what I discover.